on interview for this PMC AEI jobs. Candidates who have 5 years of Surveyor work experience they can apply for this Sahayak Atikraman Nirikshak posts before the closing date of 26-11-2018. 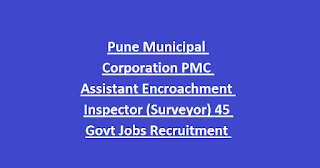 Candidates who qualified Surveyor diploma they are eligible for applying this PMC AEI jobs. Detailed information about this PMC AEI Surveyor jobs is updated below. Last date submission of application form is 26-11-2018. 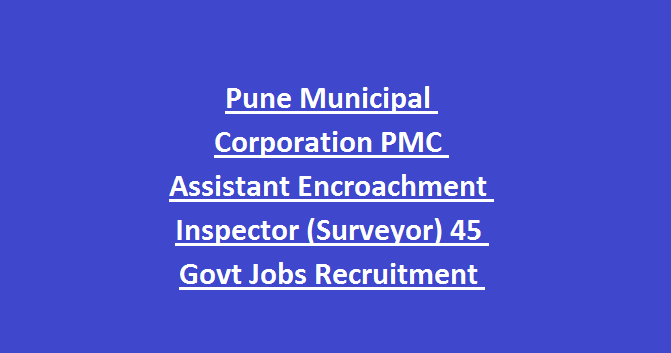 There are total 45 posts in this PMC AEI vacancies recruitment 2018. Upper age limit for open category candidates is 37 years and for others 43 years. SSC with Surveyor Diploma, 5 years of work experience is required for this PMC Sahayak Atikraman Nirikshak Jobs. Candidates selection will be based on previous work experience and interview. Application in a prescribed format to be submitted to the PMC before the closing date of 26-11-2018.